Stylish and modern, La Casa Azul is a gorgeous, five-star property that sleeps up to 7 people. It is the perfect retreat for those wishing for elegance and comfort. 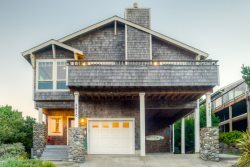 A short half block stroll puts you at the beautiful beach or in the charming town of Manzanita. Every detail has been carefully crafted to create a chic, luxurious feel for your vacation. Enjoy abundant light and a sleek open floor plan that has been completely updated and remodeled. A temperature-controlled gas fireplace and beautiful hardwood floors create a relaxing ambience, while dramatic, large windows frame the lovely landscape outside. Sink into comfortable leather furnishings while watching movies on the 50-inch, Smart TV. For chefs in your group, the thoroughly equipped gourmet kitchen with a double oven and gas range is a dream come true. All new stainless steel appliances and marble counter tops complete this recently updated chef's kitchen. This 1,900 square foot home sleeps up to seven guests and has an eight occupancy limit. There is one queen bedroom on the main level with plush linens, comfortable mattresses and private access to the deck. The main level bathroom is just across the hall with a beautifully tiled tub and shower. There are two additional bedrooms upstairs, each with a queen bed and another bathroom with shower only. A twin daybed sits in the spacious loft which also provides a great place for kids to play or have a space of there own. The basement has a washer and dryer that make it ultra-convenient to clean up after a day at the beach. The large deck has a table with a built-in fire pit which is a great place to gather with family and roast marshmallows. You can spend your days shopping in the fashionable boutiques in Manzanita, biking through quaint neighborhoods, horseback riding on the beach, surfing at nearby Short Sands, hiking Neahkahnie Mountain, crabbing and fishing in Nehalem Bay and exploring nearby towns. La Casa Azul is non-smoking. The pet policy allows up to two well-trained dogs over the age of two and flea treated. Maximum occupancy is 8 (no more than 7 adults). Steps to downtown Manzanita and the beach.